An extra £250 million is to be spent on a high-speed rail station at Euston under new plans to make it a “place for everyone”. Managers of the High Speed 2 project today unveiled a redesign to proposals for the £2.25 billion terminal published two years ago. The new blueprint includes more space for homes, offices, shops and restaurants, and staging construction work over 16 years from 2017 instead of nine to ease disruption. The extra costs would be within the overall HS2 budget of £42 billion. The revisions were meant to address Camden council concerns about the original plan, but the council immediately dismissed them as “short-sighted”. It said they would blight the area for more than a decade, while potentially failing to deliver up to 6,000 jobs, 1,000 homes and a £400 million economic boost for the area. Six platforms would be built between 2017 and 2026 to the west of the existing station, and below ground level. Five more would be built over the next six years in the area now used for platforms 15 to 18 of the mainline station. 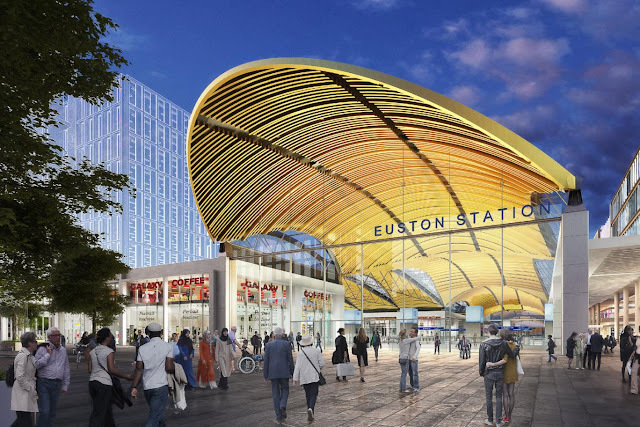 But town hall chiefs want a comprehensive redevelopment of the existing station area to include the new terminal, with HS2 and mainline tracks all on one level, and able to integrate Crossrail 2.